The clerk’s eyes lit up. 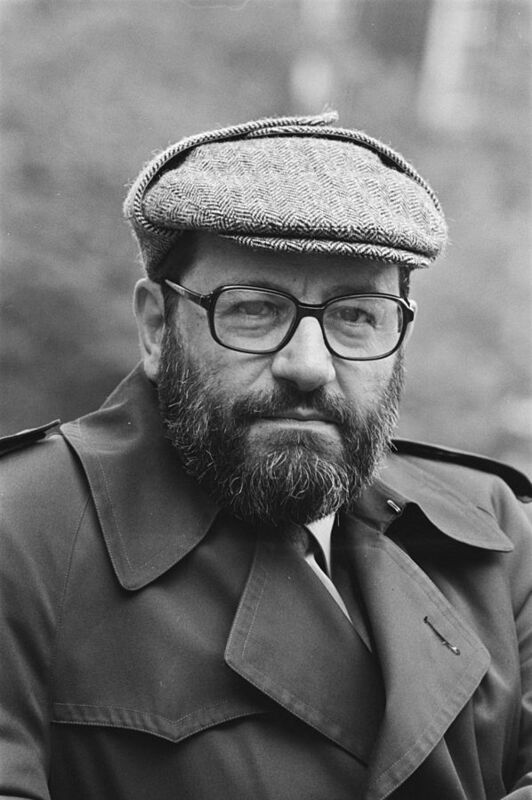 Not looking much like Umberto Eco, the clerk asked whether I was part of the Eco family or working for them, and I said I was a friend of Eco’s daughter C., with whom I had swapped tickets for a weekend escape to Rome from our life as colleagues in a Milan architecture office. In passing C. would occasionally refer to photos on newspapers of her literary parents by saying “Che tristi..” In colloquial English it could be translated as “What saddos…”, implying that from a daughter’s perspective a life immersed in a home library and a word processor did not seem as exciting as it was perceived by everybody else, or maybe she was just being humble about her dad’s fame, given we were in Italy, where of course he was considered by many, yet certainly not all, to be a kind of national treasure. “And I have chosen Italy, and have no doubts about my choice”. I feel for C. and hope she will be able to navigate this new time in her life without her father in a way that is as philosophical as some of her father’s texts. To be born in the same country is the only privilege of the masses. Enemies are the only thing that unifies the nation. Humiliation by the richness or power of the enemy. Due to an oscillating rhetorical register, enemies are at the same time too strong and too weak. Fascisms are condemned to lose all their wars as they are incapable of an objective analysis of the strengths of their enemies. Popular elitism: every citizen belongs to the best people in the world. Everyone on the hierarchical ladder despises those below, as in a military organization. Politicians casting doubt on the legitimacy of parliament because it no longer represents a monolithic “People” and their “Common Will” as interpreted by their Leader. The emotive response to a selected group chosen by the media becomes accepted as the “Voice of the People”. Individuals have no individual rights against the theatrical media fiction of the “People”. It would be so much easier for us if there appeared on the world scene somebody saying, “I want to reopen Auschwitz, I want the Blackshirts to parade again in the Italian squares.” Life is not that simple. Ur-Fascism can come back under the most innocent of disguises. Our duty is to uncover it and to point our finger at any of its new instances — every day, in every part of the world. Franklin Roosevelt’s words of November 4, 1938, are worth recalling: “If American democracy ceases to move forward as a living force, seeking day and night by peaceful means to better the lot of our citizens, fascism will grow in strength in our land.” Freedom and liberation are an unending task. Eco is no longer with us, but I fear his warning is coming true. To those who believe the fight against fascism was won in Italy and Spain seventy years ago, he said “Wait, think”. Eco offered fourteen ways of recognizing contemporary fascism, and I believe his fourteen points towards an identification of eternal fascism – which he called Ur-Fascism – or variations on them, will, as he premised them to, be valid for a long time to come. The themes of The Name of the Rose may not seem directly relevant to contemporary discourse one day, but Eco’s identifications of fascism will always be relevant if human nature remains what it is today and has been for thousands of years. The first step is to acknowledge that this time we are not speaking about Italy or Spain, we are not speaking of Mussolini or Franco. Once we accept that, we will be ripe to embrace Eco’s warning that our fight against eternal fascism has, unfortunately, probably only just begun.